This is the fifth year that Lake Oconee Dentistry has hosted this event. 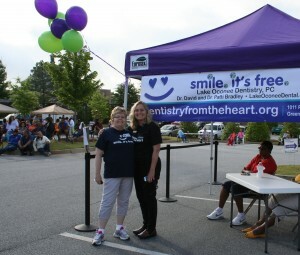 The last event, held in 2013, provided nearly $40,000 in free dental care to the local community. Dentistry from the Heart has become a way for Drs. David and Patti Bradley to share their hearts with the lake area by making healthcare available and accessible to everyone. Doctors and volunteers will treat the first 100 patients, and possibly more if time allows that day. Treatment will be provided on a first-come, first-served basis. Event registration will begin at 7 a.m. and patients will be seen through 5 p.m. Patients must be at least 12 years of age to be seen, and accompanied by a parent or guardian if under the age of 18. Patients are encouraged to dress appropriately for the weather and to bring chairs, water, snacks, etc. as they wait outside for their turn. Community volunteers and other local groups will also be on hand to assist that day. Dentistry from the Heart is a registered national non-profit organization with a simple mission — making people smile. Founded in 2001 by Dr. Vincent Monticciolo in New Port Richey, Florida, Dentistry from the Heart was created to offer free dental work to aid those in need, including the growing population of under-served Americans. Without sponsored events like Dentistry from the Heart, dental care simply isn’t an option for many people. Over 300 Dentistry from the Heart events are held around the world annually, helping thousands of patients and giving millions in free dentistry.